Media & Contents: 38 A5 sized pages plus a card cover, 28 period black and white photos, 12 full colour side profiles, one page of individual markings also in colour and one map. Advantages: Interesting and unusual subject, well covered with a very readable text. Conclusion: As an Australian, I am inclined to model subjects that we (Australia) flew during the war. The Dauntless was not one of those aircraft so the next best thing is those flown by our Brothers across the Tasman. This book will fit that bill nicely. 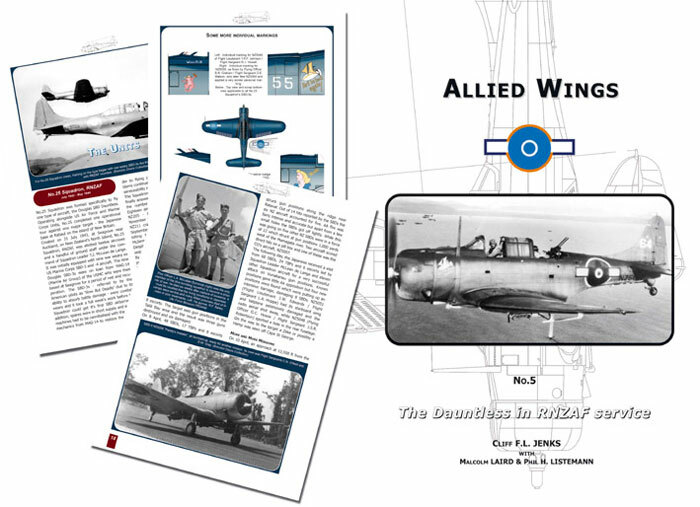 This is the fifth edition of Allied Wings and follows with the same formular as the others. Printed and Published in France but with very strong connections to New Zealand, I'm surprised it has taken this long for something with a Kiwi flavour. What better then than “The Dauntless in RNZAF service”. It begins with an Introduction explaining the origins of the aircrft, the various marks, how it performed and in whos hands, then the situation leading up to the introduction into the Royal New Zealand Air Force in July 1943. This chapter has several photos of Dauntlesses operated by the US plus four profiles of Kiwi SBD-3s and 4s while under training, the first with US markings but RNZAF serials. Under the heading of “The Units”, the next chapter begins with No. 25 Squadron, RNZAF, July 1943 – May 1944. The New Zealanders flew thee marks of Dauntless, the -3 and -4 for training and the -5 in combat and No 25 Squadron was formed especially to fly them. The first few aircraft received, on loan from the US Marines, were very war weary and it took several weeks to get some airborne but soon new aircraft were arriving and it did not take long for the Kiwis to master them dispite a fatal crash on the 13th of September 1943. After training in tropical conditions at Pallikulo, New Hebrides (now Vanuatu), they headed for their operational base at Piva via Henderson Field on Guadalcanal, all ariving by the 24th March 1944. The Squadron flew almost daily combat over eight weeks totaling 536 sorties, 1,457.4 hours for the loss of 5 aircraft and 9 air crew. On the 20th of May, the surviving aircraft were flown to Rearde Field on the Russell Islands where they were handed back to the US Marines who were surprized at there good condition considering their use. No. 25 Squadron RNZAF was disbanded at the end of May where apon it was reformed on the 30th of October to fly F4U-1 Corsairs. Most of the -3 and -4 aircraft flew with the US two colour scheme and sudued national markings with no white bars. The -5s on the other hand, appear to have had the very attractive US three colour scheme with the white bars either side of their fuselage roundels and the larger pneumatic tail-wheel as used by the US Marines for land based aircraft. As I mentioned above, if I must model a Daunless then a Kiwi one it will be. Now, where's that 1/72 scale Hasagawa Dauntless? P.S. Next from Allied Wings is the Grumman FF soon.